Minimum hire period: 4 weeks. Note: Rate is inclusive of weekly service to empty effluent tank and replenish the water tank. This single axle, towable anti vandal unit meets H.S.E. 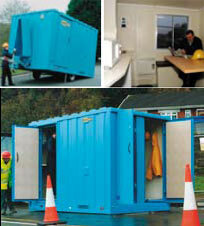 requirements and provides for all on site welfare needs. Note: A surcharge may apply for unlimited hours usage.